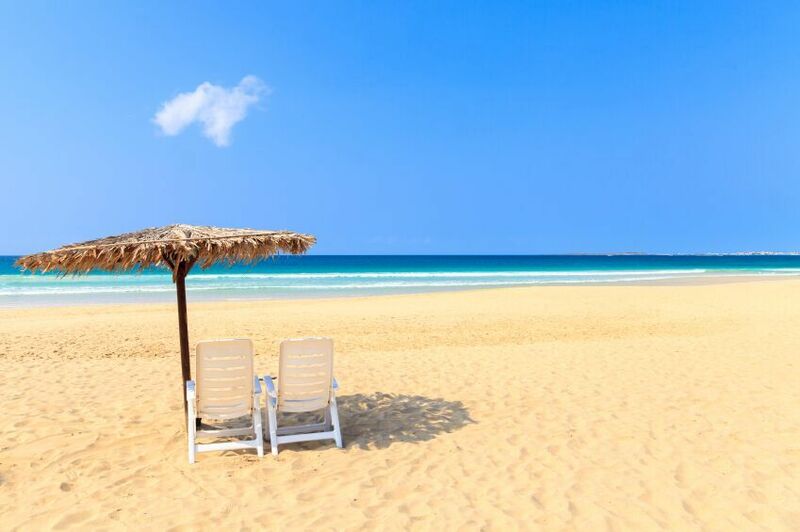 Cape Verde is wonderfully warm and sunny all year round. So if you don’t have anything in particular on your wish list, you’re likely to love the archipelago at any time of year. If you have something more definite in mind – perhaps you’re an avid hiker, marlin fisherman or a windsurfer – then timing your trip right will only add to your enjoyment. Cape Verde isn’t short of unique hiking experiences: the vistas from the famous mountains of Santo Antão, the quiet slopes of Brava and the dramatic, brooding Fogo volcano crater all make for unforgettable walking adventures. To make things easier, many of the walking trails are in fact cobble stoned paths, even in the most unlikely of places and up the steepest of slopes. Most walks in Cape Verde require a certain level of fitness as the paths are often steep, so you will need some elasticity in your knees for steep descents. If you are not a hardened walker, there are some more gentle hikes in Boa Vista and if you’re visiting some of Santo Antão’s more accessible ribeiras or Fogo’s crater, it’s easy to get a ride part of the way on a 4×4 vehicle. When to go: Cape Verde’s mountainous islands are generally more beautiful just after the rainy season which falls between July and December – rainfall is at its heaviest in August and September. Flooding can sometimes impede the Santo Antão hikes. January offers cooler average daily temperatures of 24 degrees Centigrade. The strong Atlantic winds and currents off Cape Verde create world-class waves, ideal for surfers, windsurfers and kite surfers alike. Cape Verde is particularly popular for windsurfers worldwide and regularly hosts international windsurfing championships. The two most popular and well served islands for windsurfing are Boa Vista and Sal (head for Ponta Preta). São Vicente’s Bay of Mindelo experiences an average wind speed of 16 knots between January and June with gusts of up to 30 knots. A little further along the coast in São Pedro Bay, world speed records have been set at over 40 knots. When to go: For winds ranging from 18 to 22 knots, November to the end of May is the windy season and good for intermediate and advanced riders. Even at the windiest of times there will still be some days that are good for beginners but the best time to learn is during the summer months. Diving in Cape Verde’s cool Atlantic seas may not be as famous as it is in Egypt’s Red Sea, but you will still see an exciting abundance of tropical fish. Common sights are parrotfish, angelfish, surgeonfish, goatfish, Atlantic bigeyes, filefish, cornet fish, dolphins, turtles and even the occasional whale shark. If you’re there in spring, you may even spot humpback whales. You will find dive centres on five of the islands – Sal, Boa Vista, Santiago, São Vicente and Santo Antão. Sal’s Santa Maria Bay offers the most popular dive sites including wrecks at between 5 and 30 metre, amid magnificent rocky ridges, boulders, underwater caves and arches. A favourite dive is Buracona, a 40 metre tunnel emerging at the captivating ‘Blue Eye’ pool, best seen early in the morning during summer when the sunlight catches the water making it a stunning bright blue. When to go: you will find the calmest waters and peak visibility from June to December. Cape Verde is famed for its big-game fishing. There’s an abundance of large blue marlin around the islands with 700lb fish having been caught. You might also come across swordfish, sailfish, kingfish and white and striped marlin. Nearer the shoreline, you could find wahoo, grouper, albacore, yellow fin tuna and dorado. Prime fishing can be found at São Nicolau, Maio and between São Vicente and Santo Antão. Hiring a boat for the day can get pricy (between €700 and €1,000 per day), while booking an all-inclusive week’s trip comes in at around €1,800 to €2,800, depending on numbers. For a great experience, you might get the opportunity to join the local fishermen on one of their trips, either night fishing for morays or dropping anchor by day and fishing for the likes of grouper, skipjack and squirrelfish. The locals still use harpoons to catch octopus, lobster and parrotfish. When to go: If you are after marlin, it’s best to opt for May to October, while tuna fishing is most successful in August. Cape Verde holds the third largest nesting loggerhead turtle population in the world, after Oman and the south east of the USA. The turtle nesting beaches are generally off Sal, Boa Vista and Santiago. Guided trips provide full information on the biology of the turtles and the important conservation work currently in progress across Cape Verde. When to go: August is the peak nesting season but tours to watch the loggerhead turtles start from early July until mid-October. Turtle hatchings take place from mid-August until the end of November. Cape Verde’s islands and their festivals bring a true riot of colour and the chance to experience live music at a local festival isn’t one to be passed up. The biggest celebrations take place on the island of Sao Vicente. Mindelo hosts a Creole Festival each year, inspired by Brazil’s carnival and costumes and the Full Moon Festival at Baia das Gatas is celebrated in the height of summer. São Vicente, Baia das Gatas – The full moon festival takes place towards the end of August and offers a long weekend of artists, bands and parties. The Mindelo Creole Festival in February features colourful, Mardi Gras style street parades. Boa Vista – Santa Isabel Municipality Day on 4th July is highlighted with processions, swimming and horse racing. Sal – Nossa Sra de Piedade on 15th August is celebrated with mass, processions, swimming contests and a music festival on the beach while Santa Maria Municipality Day on 11th and 12th September also offer a music festival. Santiago, Bay of San Fransisco – Gamboa in mid-May is a big music festival including international artists. Assomada – Tabanka which takes place in June or July celebrates the liberation of slaves.